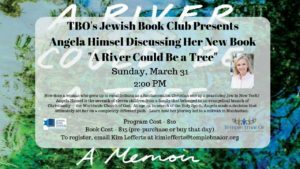 Jewish Book Club presents Angela Himsel, who will discuss her book “A River Could Be a Tree” on Sunday, March 31 at 2:00 PM. Program cost – $10; book cost – $15 (can be purchased day of). RSVP to Kim Lefferts. This entry was posted in Uncategorized on March 25, 2019 by Kim Lefferts.